Summary: Around the world, black hand prints are appearing on doorways, scorched there by winged strangers who have crept through a slit in the sky. Review: I finally got my hands on this book after seeing it on Book Outlet. I was lucky enough to also get the second book at the same time. Which is very fortunate because I need to read the next one badly! I also need to read everything that Laini Taylor has written. The writing is so wonderful. I found myself dog earring the pages to go back to certain sentences. 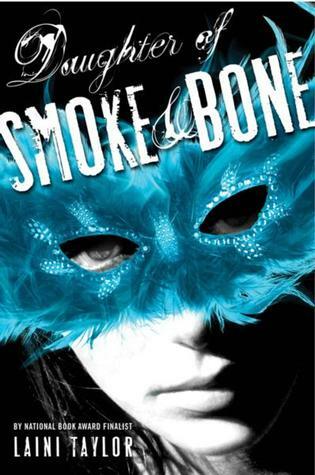 It is such a different YA supernatural novel compared to most in its genre. It goes into it in such a unique way it’s refreshing. There is definitely some “insta-love” but I promise if you keep reading it’ll get better. There’s also no love triangle! The characters are great. The storyline is amazing. The setting was different. The supernatural beings were unique/different than the norm. The only thing I didn’t particularly enjoy is when the story slowed down and another one was thrown in there. It sort of felt like it came out of nowhere. Then it returned to the original storyline. I feel like if more weaving was involved it wouldn’t have seemed so sudden but I also see how it works. Also this book really makes me want to go to Prague.